Home→Manchester Walking Football→Is Walking Football Over 60’s, Over 65’s The Answer? Is Walking Football Over 60’s, Over 65’s The Answer? 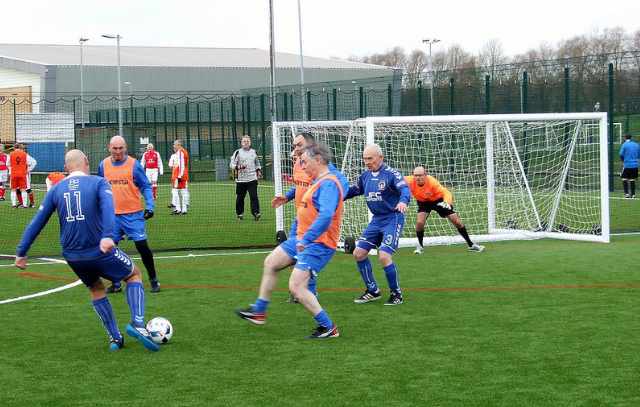 This is an article reproduced from the Walking Football United website, so we ask the question – Is Walking Football Over 60’s, Over 65’s The Answer? Reports are continually flooding in from teams that have competed in competitive walking football matches this weekend (February 25th/26th) of widespread issues that have saddened at best, shocked at worse. Player bundled into barrier. Player kicked whilst on the ground. Out and out running. Undiluted physicality. A match halted for 45 minutes due to a serious spat. Other coming togethers, needing players separated from each other. Young referees presiding over games they are ill-fit to officiate in. Some without the rules copy itself. Tolerance from refs that border neglect. Player health & safety at an all time low. Two teams vowing ‘never again’. WFU has all of these email accounts and is in dismay at the lack of progress made in the game. There have been incidents of this nature in previous WFU tournaments and the worry is that the trend continues throughout the rest of the year. It appears the bully wins the playground yet again. Sour grapes from losing participants say the victors? Not interested. They are right. The competitive game is slowly losing its footing. What on earth do players think they are doing! Totally deluded if in their mind they are playing walking football. It is nothing but regular 50+ 5-a-side. Absolutely no consideration for the ethos. Run as you like. A dreadful indication of where the game is presently at. So why put on tournaments? It wasn’t a consideration back in 2014 that as each year goes by, the game becomes all the more disengaged from where it was envisaged. New teams, new enthusiasm. Teams abiding by the rules brushed aside either physically or blown away by the wind of opponents rushing by. What do the bully boys and run merchants care? I dare say that they even read the rules, embrace the ethos or give two hoots about Fair Frank or Walking Will. Is the prize that big that bundling someone’s grandfather into the barrier, or lamping someone because they put in a late clumsy one, worth the silverware and a some revisit to halcyon glory days over respect and self-respect? A dark weekend. Is there a light at the end of the tunnel? If you’ve had a good referee this weekend, or had games played in good spirits, no issues or unwelcome experiences (and there would have been many,) you’ve been fortunate. Many haven’t and almost a dozen teams have vowed ‘never again’, and these are the teams that need saving. Forget poor arrangements, introducing rules far too late, using voluntary referees of the centres themselves, inept officiating, poor scheduling, the problem is at this moment in time critical. The answers will not come from the participants themselves. Far too ingratiated with their individual and collective selfishness, the game is spiralling out of proportion. Far removed from walking and gracious conduct, we will be left with only the battle hard and the bullies, the sly and the sleek participating in competitive walking football, and these teams are clearly not worth coveting at the expense of the meek and the mild. A meeting will be asked to be convened between the WFA and the FA as soon as possible. Additionally, here are our members websites that found the FA People’s Cup a poor experience. Read here and here. I will be the first to admit that we also were physical, it was a case of stand up and be counted or let the bully boys take control. As a club with an average age of 63, we Vintage Celtic, are almost definitely going to avoid over 50’s tournaments in future. I also know that Rochdale AFC Strollers, another of our members, had a similar experience in the same tournament and are likely to make the same decision. Doesn’t make good reading does it? So please leave a comment on your views as to the question Is Walking Football Over 60’s, Over 65’s The Answer? Let’s accept that surprisingly there is a huge demand for a type of football for the over 50s. It is not walking football though. It is what I shall call supervets, small sided games on smaller pitches with limited contact and a ‘one foot on the ground’ rule. Let these competitive types have their own sideshow but let it be known not as walking football. The FA have been lazy in their definition of walking and have degraded the whole sport by so doing. Walking Football United have addressed the issue and defined walking in a clear and measurable way, heel first, straight leading leg, etc. The Groucho Marx crouching run with both knees bent that you see in many online videos is not permitted. The social benefits claimed for walking football are no less valuable in supervets and is a great motivator for the participants so we should build on that by developing the supervets game as a separate sport. I maintain that splitting up what we have now into tighter and tighter age groups is not the answer. Referees can not inject the philosophy into players. Anyone should be allowed to play walking football as long as they can conform to the spirit of that version of the game. Agree with an age specific set up, but must be 50 to 55, 55 to 60, 65 to 70. A difference in age if 8, 9 or 10 yrs is far too much. Having played in quite a few competitions 55+, then at the age of 64 it can be a little too competitive. There seems to be an understanding within the 50’s sections as to try to get away with as much as they can, running, making contact etc. Stronger refereeing required. Agree with the above and would also recommend a more age specific set-up i.e. over 50`s up to age 60 and over 60`s playing separately up to 70+. At the moment 70 + year olds are playing much younger just over 50`s, that is unfair as there is a great difference in physicality between these ages. I believe the less combative `slower` football would be better for the over 60`s and should be segregated into different leagues, cups etc. Just an idea. Let’s brand and franchise it as ‘SoccerLite’ – so it’s ‘what it says on the can’. Walking Football only identifies a rule not an ethos. Tournaments will always attract pothunters and the associated physicality like they did when we were kids. I play WF at 71, but get (and give) my knocks playing elsewhere with nominal over 35s! I accept (stern) reminders from my side and opposition when I get the two disciplines mixed. That’s one of the problems with age and memory! OK Bill – thanks for that. I did wonder what had happened, but things can go astray – I know that to my cost. A second attempt at posting here. The first seemed to disappear without trace. It can happen. I’ve tried to recall what I said initially, but there are differences now another day has passed since the competition in Manchester. As our website has been linked within the article above, I think a summary of events is required. The problem is a lack of assertive Referees, and may always be so. We pay our regular Referee £10. He is out of action at the moment but he is known to players in the GMWF league, he knows walking football and he is in my opinion anyway, excellent. We pay our own committee members £5 when they do the job but that money is merely diverted into a ‘buffet’ fund for entertaining guest teams. We make a mean sandwich. Seriously? Effective refereeing is crucial. We played four games in this ‘People’s Cup’ competition. I will leave running aside. We were as guilty as most. The main problem was physicality. Intimidatory tactics. Our team is largely made up of smaller, nimble players especially up front. They have phenomenal goal scoring stats in internal and external games. On Saturday we faced cynical aggression when some teams – desperate, it seemed, to progress, tried to intimidate them with bigger men of lesser talent. Didn’t work though, did it? We lost just one game, 0-2 and did not capitulate under an element of physical duress. By no means all of our opponents on the day were dishing out inappropriate physicality. All of our games were filmed and it’s been really interesting watching them back. I acknowledge one of our players eventually reacted to being pushed – off the ball – but fortunately the opposition player moved away quickly to diffuse the situation. All that said, it’s time to move on. Enough looking back on an afternoon that taught us much. The coverage given and reactions to, this subject indicates a wider malaise within this infant game that threatens to ruin it for many, and will drive groups like ours at Denton away from competition altogether. Which in its way is a shame, though not the end of walking football for those who embrace the true spirit of the game. From now on TAMESIDE STRIDERS will pursue a largely ‘friendly’ game policy with teams with whom we can develop a rapport over time, and who share our ethos. Such as no studded boots on artificial surfaces, and no need for compulsory shin guards either. We make it publicly known that we play for enjoyment. Results matter but are not important, certainly not enough to set out to deliberately injure somebody. Those who disagree can go and play football, (or THEIR version of walking football) elsewhere. We derive more than enough enjoyment internally to keep us all playing for as long as our health allows. The Nash Amblers, currently competing in the GMWF Over 60’s League in Division 2, with whom I co-ordinate matters and have a degree of input, are reviewing attitudes towards competitions. It is unlikely that Over 50’s tournaments will be on the radar any time soon. Alan, I found your 2 comments in the spam folder, why they ended up there is probably because of the length of them. Many spammers try to post large amounts of text, that’s the only reason I assume they ended up there. Anyway they are now published. Absolutely spot on you need strong refereeing for these games and consistency, or the game will break into 2 distinct levels 1) tournaments for these mean spirited sides, that have a win at all costs mentality that has not changed since they were playing in their 20s and 30s. 2) sides just playing amongst themselves, or against like minded teams who do it for the fun and love of the game. I am 73 and have not played WF yet, but fully intend to soon out where I work in Kazakhstan and Turkey where I live and have been inspired by my younger brother who has been playing for 2 years now and it has helped him health wise and the making of new friends in his late 60s. As our website has been linked here I will offer a reply. The lack of assertive Referee’s was a major problem. It may always be so. We pay £10 per game for our regular (excellent) Referee. Sadly out of action at the moment and who officiated at the last session of the GMWFL. We pay £5 To members of our committee when they do it – that money is merely diverted to our buffet fund for entertaining guests. Our team is quite lightweight compared to some, especially up front. Mobile, nimble men with phenomenal goal scoring records in internal and external games. There was an attempt to intimidate them by much bigger men with lesser talents. We make it known that we play for fun and for enjoyment. That results matter, but are not important. Certainly NOT important enough to risk injuring people deliberately. At times on Saturday we faced cynical aggression. Didn’t work. Did it? In future NO MORE Over 50’s competitions and TAMESIDE STRIDERS will pursue a ‘friendly’ game route with teams we can develop a rapport with, based on good humour and mutual respect. and whose ethos fits in with ours. For a start – no studs and no need for compulsory shin guards. The Nash Amblers are currently reviewing attitudes to competition but Over 50’s is not an option at the moment, and likely to remain so. It is down to the referees, at the last Heywood meeting our first ref penalised all contact, shoulder charges, tackling etc. The second ref let things go and as a result niggles started resulting in an elbow to the eye of one of our players. We play non contact at our club and every one enjoys it, that’s what we turn up for, a good time which is enjoyed by everybody. The competitive edge is good but if it is win at all costs then no-one wants to take part. The refs can ensure that this is not the case. We need to give them the authority and then support them. Totally agree with everything said. I have just turned 70, I play for Senior Seasiders ( Blackpool). I love the game, it brings back memories of my early playing days in Manchester. I would hate for it to collapse for the sake of individuals who were probably as bad in their youth. Referees are the answer, had a few really good ones, and a lot of young teenage refs who don’t show authority. I have seen plenty of bad tackles that warrant the sin bin, the only way to stop this is to clampdown on them. Maybe the only answer is to start paying for proper refs who are street wise.